This uniquely styled piece is made with UltraHide Simulated Leather that has the look and soft feel of rich nappa leather and a vertical color accent. 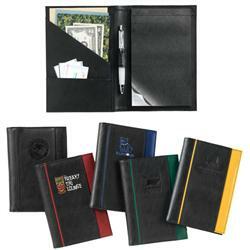 It has one large slanted interior pocket for large papers, an additional interior pocket for business cards or other small items, and a wide body pen loop. Includes 5" x 7" writing pad with matching cover to keep your notes private. We love that it comes in so many colors - who really wants another solid black notepad? Production Times Available: 5-7 business days standard. Please inquire for rush production! Available Imprint Options: Deboss or screen. Cost for additional imprint colors varies depending on quantity. 30 pieces per box, 21 lbs per box.